BREAKING NEWS: the Chupacabra is loose in Deer Creek!! This time of the year is generally pretty slow for journalists, columnists, and people who write stupid listacles for beer money. Not a lot happens in the summertime. The most interesting thing to come from the gubernatorial race is a spelling error. Teachers aren’t protesting because they’re too busy finding 2-3 part-time jobs so they can afford to teach the upcoming school year. And Fallin is too lame of a duck to do anything noteworthy nowadays. That being said if you work in the media, you have to take what you can get if you’re going to get articles out. Which is probably why KFOR is reporting on mythical creatures. “That’s immediately what we thought, and it looks exactly the same. There’s not much difference at all,” Craig Martin told News 4 back in 2013. Look, I know that 87% of Deer Creek residents’ caloric intake comes from Pinot Grigio. But thinking that the “Chupacabra” is in your backyard is more of a side effect of meth or living in the shady 580 area code rather than alcohol. What makes Mike think the animal is a mythical creature over something native to Oklahoma, like a coyote or some cosplaying Furry? Mike did some research and came across the link to the story we did in 2013 about the possible chupacabra sighting, in the same area where the Curtis’ live. “We watch the video, read the article and we’re like, wow, this thing looks just like what we have on video. The guy had it on picture; now we have it on video,” Mike said. So, you’re telling me that KFOR reported a story on a guy who claimed to have found a real life Chupacabra, while using a different KFOR article as their only evidence for the validity of his claims? Is that what it takes to make it in journalism these days? In that case, I’m submitting my next listicle “10 Edmond neighborhood dogs I can convince my nephew are the Chupacabra” to KFOR’s news tip line. At least my article will have more than 2 pictures to back up my claims. Chupacabra sounds much more romantic than a coyote or fox with mange. The critter in KFOR’s pictures is the exotic species canis familiaris. How could anyone believe otherwise, unless he has never seen a dog before? 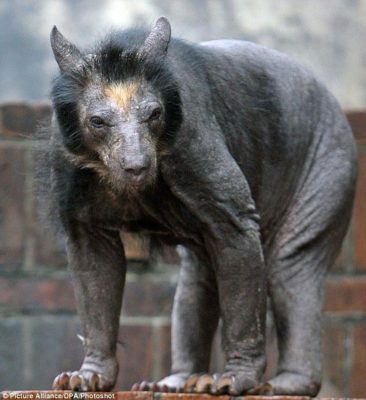 Hayley’s photo of the shaved bear is the most disturbing thing I have seen in a while. KFOR, ugh! They’re the most sensationalizing group in the state! After studying mass com back in the day it’s really hard to watch their reports without clocking their tricks to get viewer attention. I guess that means they’re doing what they get the big bucks for. I like the shaven bear pic! Feel sorry for the bald creature though. How do you shave a bear? Asking for a friend. Can’t be a chupacabra. They have better taste than to hang around Edmond. But I like his cut! Wonder who his stylist is? Is this an Ogle mutation or a Swamp/ Deepstate creature favored by the Mainstreamers. Other than that I found myself wondering why I was even paying attention to this nonsense. I swear I saw a Chupacabra off of Santa Fe Avenue near the state capitol last year. It ran in front of the vehicle in front of me. It brought traffic to a standstill and everyone just sat there staring at it. So if you want to find one, go look in the fields off of Santa Fe by the state capitol! So if is or was it would be in Spencer Midwest city grounds. By 36 and and west Mister is a family that I no that goats chickens and cows. And there hisp but when if that was what we saw not just me a big dog like body but was running it was black and grey but ran Luke a wolverine with long hair.and was fast.the picture in my head looks like the on yAL have posted. Crazy wate tell u. See what the gods have more to show like bigfoot. And the Crimson cougar ,Midwest black bear there is lot of animal in Midwest city Spencer place. Like the road runners. And we saw and got pics of a dead bever on post. Road were there house no place u would think it would be .thank 4 reading. Facebook caljay teas.